The Kirkcudbrightshire Dee is the largest of the Galloway rivers, covering a catchment of over 1,050 km2 in South Ayrshire and Galloway. 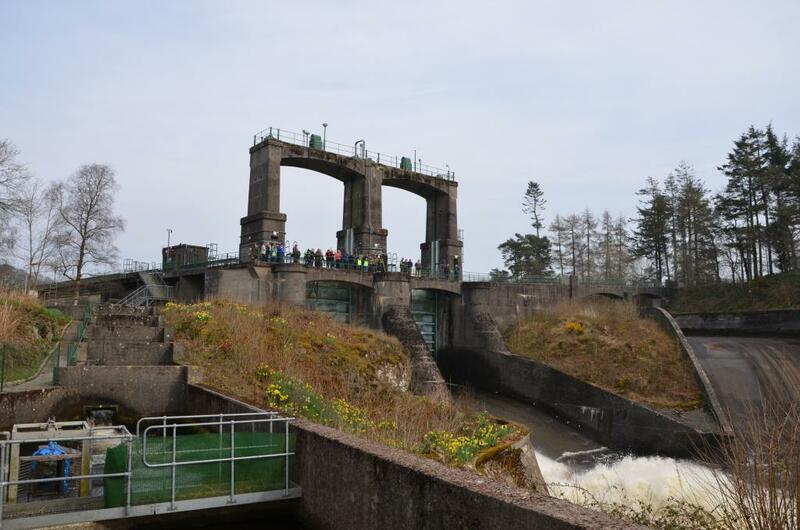 Upon the river, the Galloway Hydro Scheme has been operating since the mid 1930’s and consists of six power stations, eight dams and a network of tunnels, aquaducts and pipelines. Tongland Dam sits at the bottom of the scheme, about a kilometre upstream of Tongland Power Station which is located within the tidal limit of the river, near Kirkcudbright. Migratory fish returning to the Kirkcudbrightshire Dee must navigate up to and negotiate through Tongland fish pass to make their onward journey. Tongland fish pass climbs over 200 m in length and can take salmon up to a day to pass through (see Marine Scotland Science Report 05/12). Once above Tongland Dam, fish can travel as far as Kendoon (aided by fish passes at Earlstoun and Carsfad), where their journey ends (as no fish pass exists). Although it was once famed as one of the best salmon rivers in southern Scotland, stocks have fallen greatly over the years. 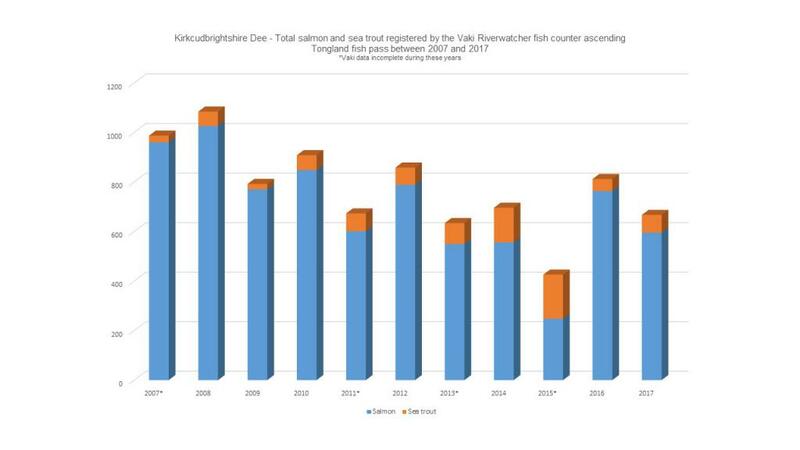 Data from the fish counter at Tongland Dam best illustrates this trend and since September 2002, the Galloway Fisheries Trust has been contracted to undertake data collection and maintain the Tongland fish counter. In June 2007, the original resistivity fish counter (of which there are still 24 in Scotland) was replaced with a Vaki Riverwatcher. 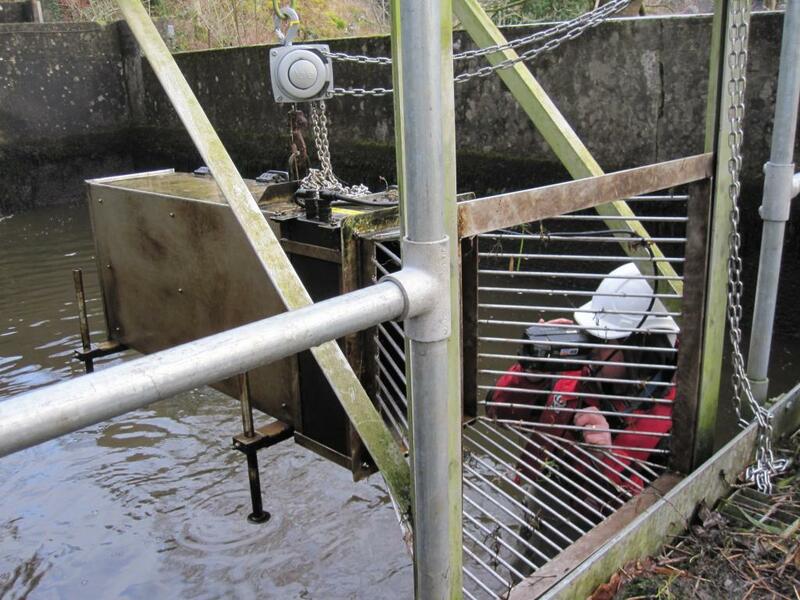 The Vaki Riverwatcher is an optical fish counter for use in fish ladders, barrier dams or other places where fish swim through a restricted passage. At Tongland, the pool and weir formation of the fish pass presents the ideal location to site a counter and it is within a large resting pool that the Tongland Vaki Riverwatcher is currently located, at the exit of a submerged orifice. The Vaki Riverwatcher consists of a Control Unit with software, a Scanner Unit with cables and a computer program for processing the data. 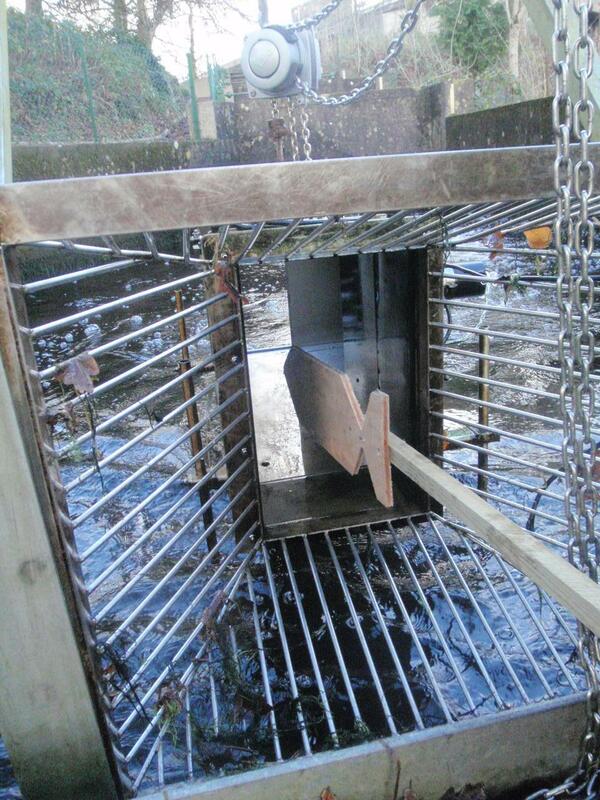 The Scanner Unit can be thought of as a gate that is placed in the fish ladder. When a fish swims through the Scanner Unit it interrupts beams of infrared light, producing a silhouette of the fish that is used to count it and calculate its size. Data sent from the Scanner Unit to the Control Unit give details of the time/date of passage through the fish counter, depth and length of the fish, its speed, direction of movement and the temperature of the water within the fish pass. 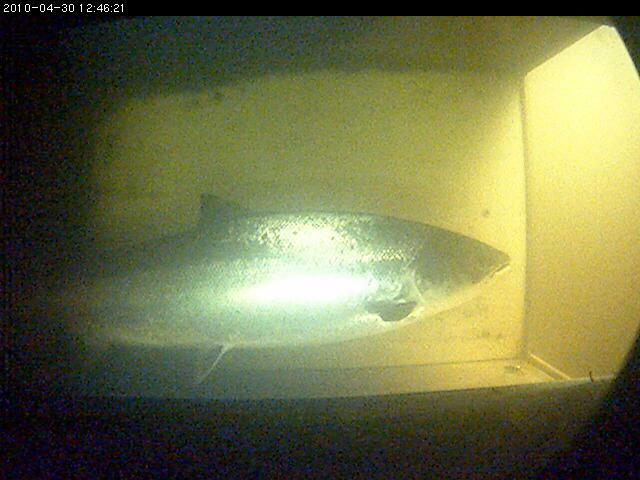 Counts are verified using this data accompanied by a 16 second video clip which is produced by the camera unit, located at the upstream exit of the fish counter tunnel. Annual counts of salmon have varied quite considerably between the years that the Vaki Riverwatcher has been operating, with returns best in 2007 and 2008 when around 1000 salmon were recorded, when peaks in movement took place in July, August and October. In recent years, only 500-600 salmon have returned and there has been a noticeable shift in migration patterns with the summer peak in fish movements occurring earlier (across June and July), whilst the autumn peak has all but disappeared. As well as providing data to inform local fisheries management (Tongland fish counter data is used to inform water management plans, hydro scheme maintenance plans and broodstock collection plans on the river), Tongland is one of ten counters currently being used to improve the accuracy of Salmon Conservation Regulations (SCR) assessments. River gradings under the SCR are determined by comparing numbers of salmon eggs deposited against a target level. Presence of a counter allows direct enumeration of the stock of salmon in a river rather than making a stock assessment on rod catches. Marine Scotland Science are currently investigating how they could develop their national network of salmon counters for stock assessment. 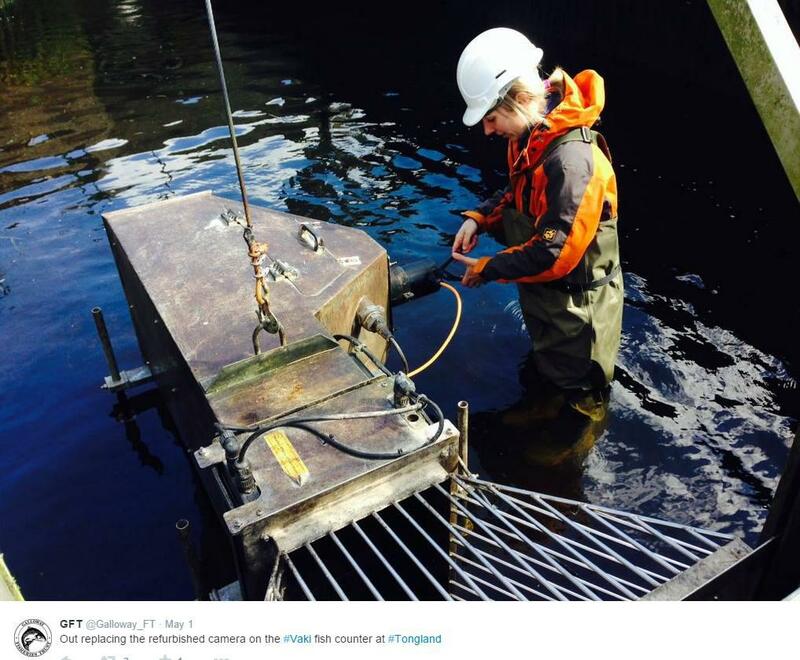 Where in-river structures (such as existing weirs) are already present at the bottom of a river, there may be opportunities to install new fish counters and GFT are currently investigating this potential on all the rivers in Galloway.